Dark Realm4 is done! What's next? Yeah, I finished DR4 last night and shipped it to my editor. Today, I’m working at catching up on everything I let slide while I pounded out those last chapters. That includes catching up on plans. 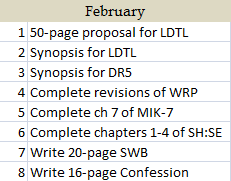 This is what February looks like for me. Listed in priority. It’s a lot and has to be managed around a trip to Oklahoma for a plotting bootcamp my sister and I are leading. But it’s doable–IF I write 50 pages a week. I was doing that and more for DR4, but I’m in need of a break. I don’t have time for one. When I turned in that book, I satisfied my last contract. So, now I have to search for the next big idea, the next hottest thing to snag an editor’s attention. If you have any ideas, pitch ’em my way. I’m thinking something “cowboy” next since I just dragged my hero and heroine out of Hell. I need a change of scenery.